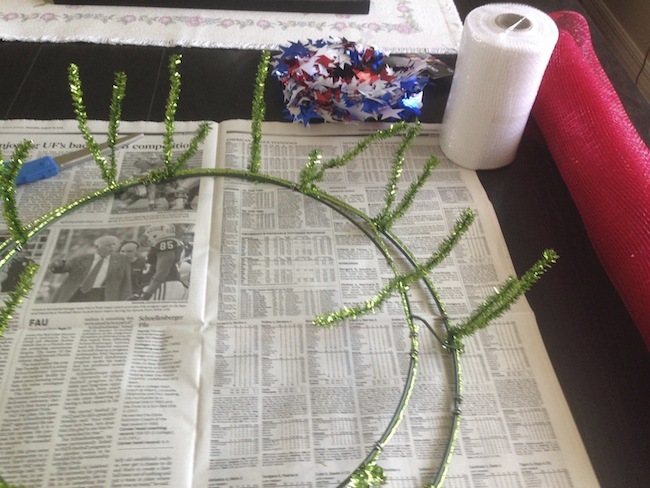 Patriotic Deco Mesh Wreath Tutorial | Be Plum Crazy! 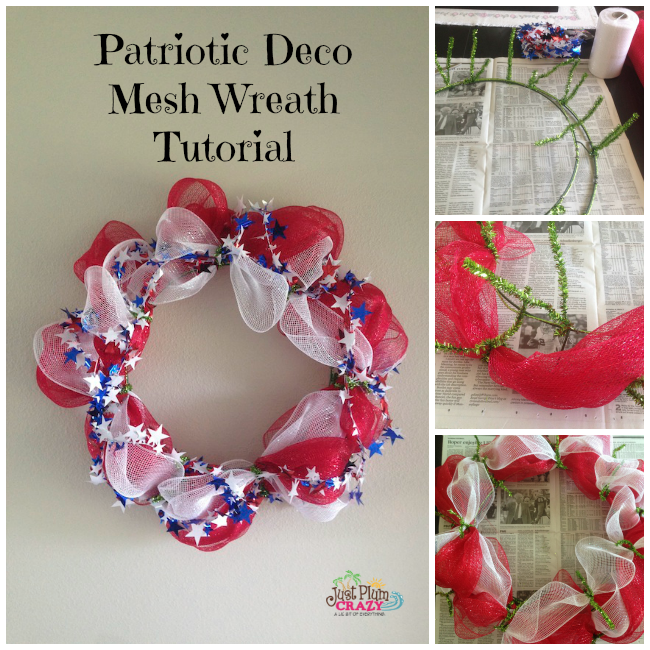 Patriotic Deco Mesh Wreath Tutorial! Welcome to day 5 of 12 days of Summer Celebration. We could choose anything we wanted to make, recipe, craft, DIY, etc. 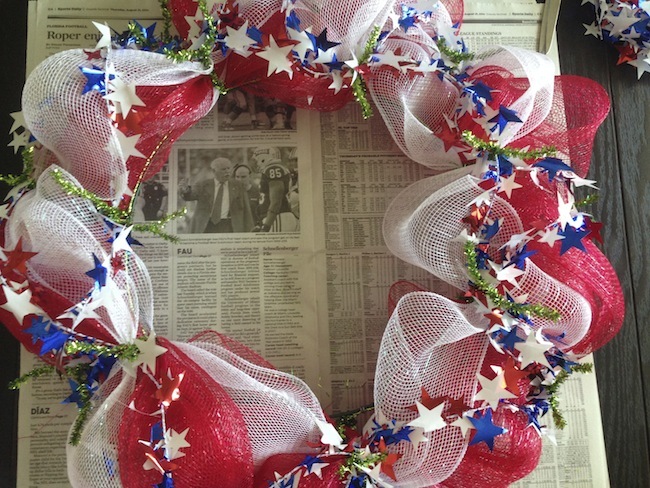 I chose to make a Patriotic Deco Mesh Wreath. My grandson’s birthday is on the 4th of July and my granddaughter’s is on the 5th, so when we celebrate, we go all out. Food, decorations, fireworks, you get the picture. A deco mesh wreath is easy to make and although there are many variations of how to make one, I have tried most of them and this way seems to be the easiest for me. So follow along and you will see just how easy it is. Don’t forget to stop by and visit all the other participating blogs on the linky below and see what recipes and fun ideas they have for the 12 days of Summer Celebration. 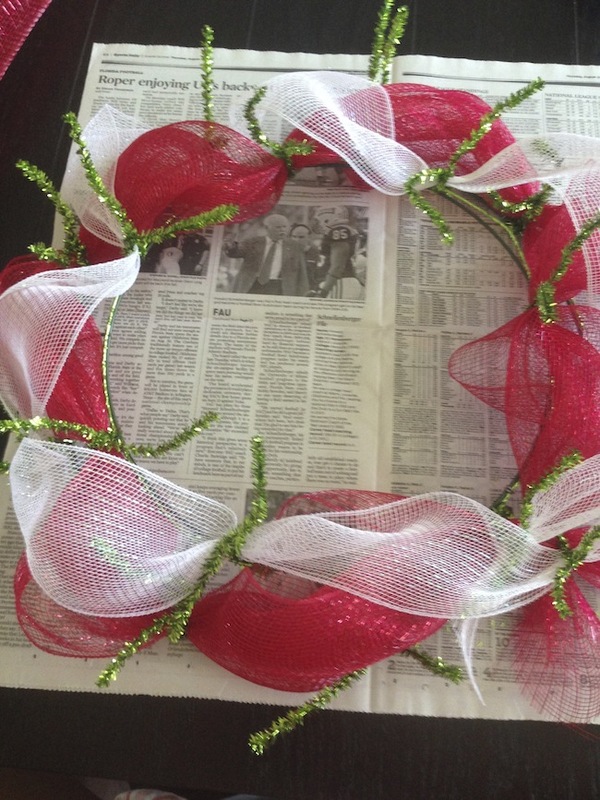 1 wire wreath with attached wires. 1 Large roll of Red Mesh. 1 Small roll of White Mesh. Any embellishments you would like to add. The good thing about this wreath is you can use any of the colors you would like. You can use a white big roll, a blue big big roll, any sort of embellishments you would like, it is totally up to you. My husband usually helps by holding the roll and unrolling it for me so it doesn’t get all twisted. I start at the bottom and work my around the wreath alternating between the outside ring and inside ring and every other set of pipe cleaners. Just grab a bunch and place it inside the pipe cleaners and twist closed. I usually only twist it once so it stays in and I don’t have to untwist to add my garland or another color. Grab the mesh about 4 inches and twist it in the next set of pipe colors. Now you are ready to start your next color. I am using white. Start at the bottom in your next empty spot and work your way along as you did with the red. 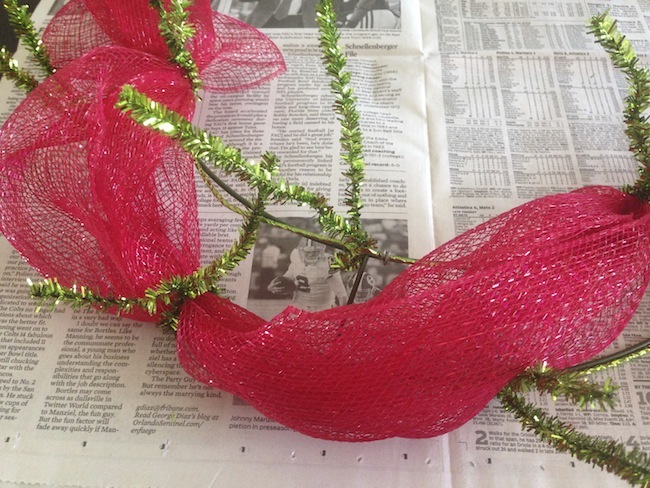 Once done with that color, you are ready to add the red, white and blue star garland. I had enough of this to go around twice. Alternate the same way as you did with the red and white. Once finished with that, you can twist the pipe cleaners tight. I usually twist them around back to finish up so they don’t show. That’s it! You are done. Find a wall or door to hang it on and have a wonderful summer. What are some of your favorite summer celebration crafts or recipes? 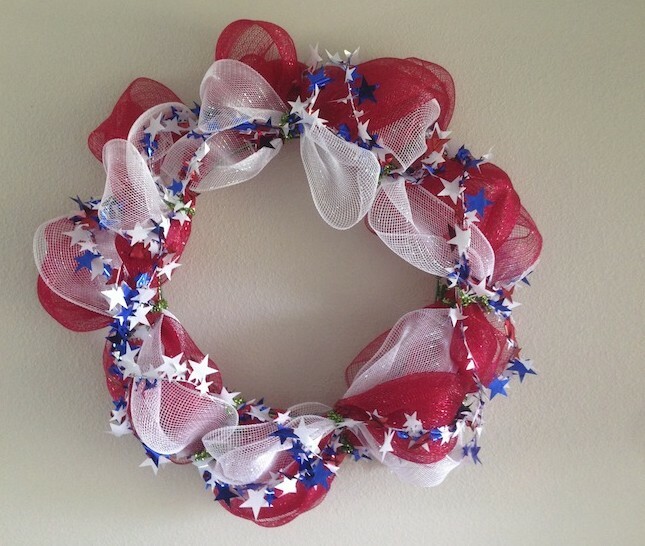 Topic: Patriotic Deco Mesh Wreath Tutorial! Previous Post: « Home Building Tips: 5 Things Not to Forget!